March 18, 1854, Ansel Parish (1824 -1891) was ordained an Elder in the Primitive Baptist church. He was a son of Henry and Nancy Parrish, and son-in-law of William Anderson Knight, pioneer settlers of old Berrien County, GA . Ansel Parrish had joined Pleasant Church at the age of 19, and thereafter dedicated his life to the service of the Primitive Baptist faith. Elder Ansel Parrish was one of the ablest and best known Primitive Baptist preachers of his time. During the Civil War he ministered to the confederate soldiers in 50th Georgia Regiment at their encampment near Savannah, GA. He became a leader among the Primitive Baptists, and preached at many of the churches in the area. March 18, 1877, Martha Ada Swindle was born in Berrien County, GA, a daughter of pioneer settlers Nancy Jane Parker and James Swindle. James Swindle moved his family to Berrien County some time in the 1860′s. The Swindle farm was located about two miles outside Ray’s Mill, GA.
March 18, 1908, it was announced that A. 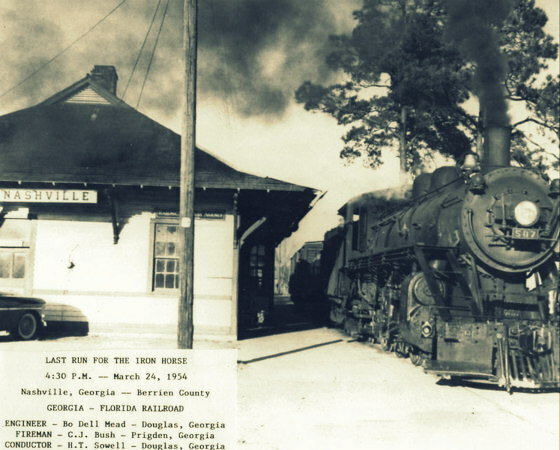 & F. Wright had been awarded the contract to lay track for the Georgia & Florida Railroad from Valdosta to Nashville, by way of Rays Mill, GA. The track was to be laid in just three weeks, and regular passenger service scheduled to begin on October 1, 1908 with two trains a day stopping at the station in Rays Mill. March 18, 1910, J. F. Buckholtz sold to J.M. Deloach the “lot No I in block No. 2″ in Ray City, located on the present day corner of Ward and Jones streets. Bucholtz had acquired the lot from Dr. Charles X. Jones. Within a month J.M. DeLoach flipped the lot, selling it to Levi J. Clements, who later owned the Clements Lumber mill at Ray City. During WWI, J. M. Deloach jumped from the deck of troopship HMS Otranto when it went down off the coast of Scotland, becoming one of the few soldiers from Berrien county to survive the sinking . March 18, 1916, Ellen Gaskins and Wayne Putnal were married in Berrien County in a ceremony performed by Justice of the Peace J.W. Moore. Ellen was the 16 year-old daughter of Mary E. Strickland and Levi J. Gaskins of Rays Mill, GA. For a few years Wayne and Ellen Putnal lived at various locations in the area, before settling a big farm out on Park Street extension on the south side of Ray City. Wayne Putnal was known as a very industrious man. During the week he worked his farm, and on Saturdays he worked as a barber, cutting hair at a barbershop in Ray City. In their later years, the Putnals moved from their farm place to a house in town. They spent the rest of their lives in Ray City. March 18, 2010, Dillard Maurice Markham passed away Thursday, March 18 at his residence in Virgina. Born April 2, 1920, in Bedford County, a son of the late Elmor Dove Markham and the late Gracie Markham. He was preceded in death by his wife of 66 years, Ruth Boyette Markham, who was born at Ray City, GA. The two met while Markham was stationed at Moody AFB during World War II. William H. “Howell” Shaw was born in 1925, a son of Chester Clyde Shaw and Golie Lee Gaskins. 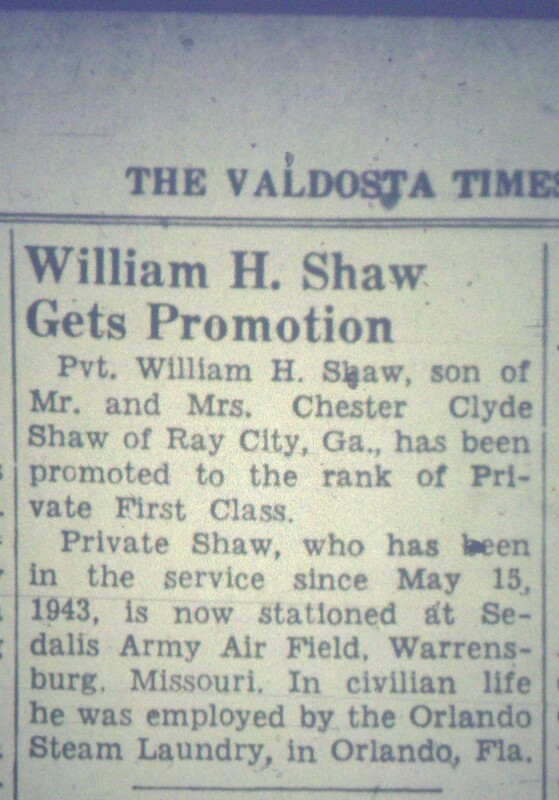 He was a grandson of Lacey Lester Shaw, of Ray City, GA.
Howell Shaw’s father, Clyde Shaw, grew up in Ray City, GA where as a young man he was a “collector” for the telephone company in the 1920s. His mother, Golie Gaskins, also a native of Ray City, was a daughter of William Thomas Gaskins and Vinie Ellen Hall. Howell Shaw was first enumerated in the census of 1930, when he was five years old. At that time his family was living in Valdosta, GA in a rented house on North Alley Street. His father was employed as a bakery salesman. Within a few years Howell’s parents moved the family back to Ray City, where Howell spent the rest of his childhood. 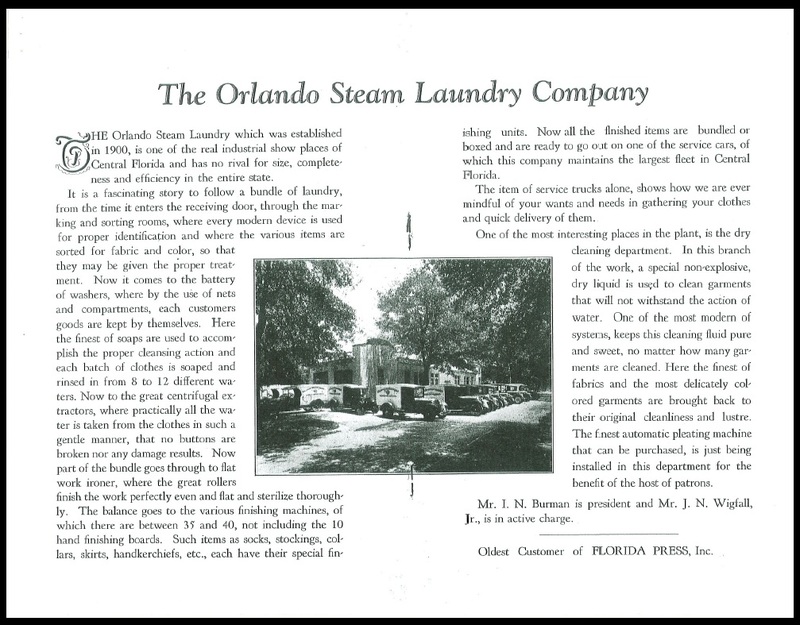 As a young man, Howell Shaw found his way to Orlando, Florida where he worked for the Orlando Steam Laundry. On May 15, 1943 eighteen year old Howell Shaw joined the United States Army as a private. He eventually was stationed at Sedalia Army Air Field in Missouri. 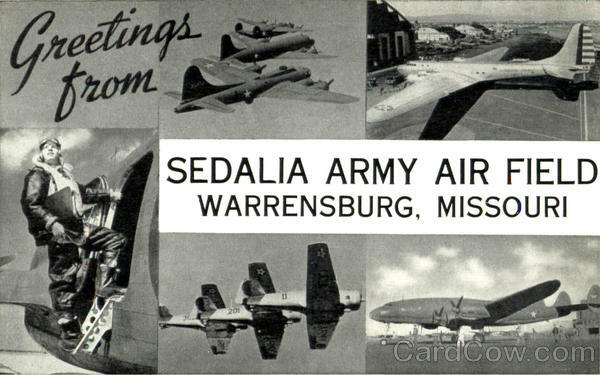 Sedalia Army Air Field had its beginnings in 1942 when US Army Air Corps officials selected the Missouri site as a training base for WACO glider pilots. Following an intensive construction project the field officially opened three months later on August 6, 1942. In November 1942, the installation became Sedalia Army Air Field and was assigned to the XII Troop Carrier Command of the Army Air Force. The field served as a training site for glider tactics and paratroopers. It was one of the eight bases in the United States dedicated to training glider pilots for combat missions performed by the Troop Carrier Command. Pilots flew C-47 transports and the Waco CG-4A. The forest green, fabric-covered gliders could carry 15 fully equipped men or a quarter-ton truck plus a smaller crew. They were towed in either single or double tow behind the transport aircraft and could land on fields not equipped for larger aircraft. The 99th Trooper Carrier Squadron was activated on August 1, 1943 at Sedalia Army Air Field in Missouri. The squadron’s first combat mission was to drop members of the 101st Airborne Division into France on D-Day as part of the June 6, 1944 assault on Normandy. Other Ray City men in the Army Air Force included B-26 Marauder pilot James Swindle, B-24 Liberator pilot Max Maurice Johnson, and flying officer Jim Paulk. Sgt. Mitchell Moore was assigned to the 854 AAF Bomber Squadron, 491st Bomber Group, flying as a crewman on a B-24 Liberator. Charles Shaw was sent to the 96th Bomb Group, 8th Army Air Force, stationed at Snetterton Heath, England where he joined the crew of the B-17 Mischief Maker II. William C. Webb served in the Medical Corps of the Army Air Force. Lt. Jamie Connell, of Nashville, served as a navigator-bombardier. Saunto Sollami served in the Army Air Corp and came to the area after the war. Lyman Giddens’ barbershop was one of the historic businesses of Ray City, GA. The barbershop was in a small one-story wooden building located on the south side of Main Street, about where the present day Post Office is located. Next door, on the west of Franklin’s barbershop was the first gasoline station ever built in Ray City, GA. The gas station was in a brick building constructed around 1925 by Gordon V. Hardie. The gas station was set back further off the street than the other businesses, but a shelter extended out from the building to cover the gas pumps. Next in line was was Leon Bradford’s barbershop. Then came the grocery store owned by Marvin and Arlie Purvis which was next to the tracks of Georgia & Florida railroad. Between Purvis’s Grocery Store and the tracks, was the big wooden water tower which provided water for the old steam engines that pulled the trains. These buildings were located on the south side of Main Street just east of the tracks. 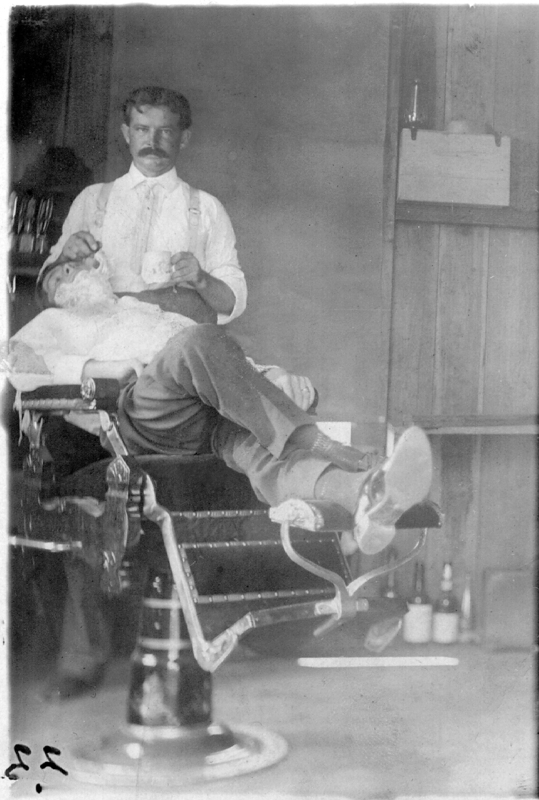 In addition to operating the barbershop, Lyman F. Giddens was Justice of the Peace. He conducted his official business out of the barbershop. He kept a desk in the corner of the shop that was always piled high with papers.